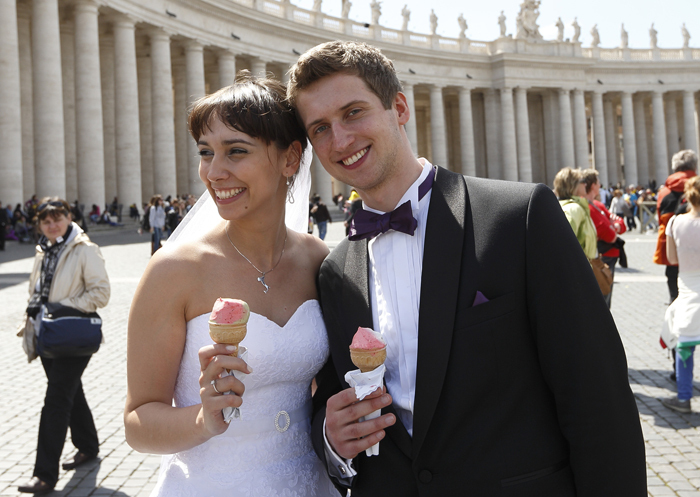 VATICAN CITY (CNS) — Through the sacrament of matrimony, married couples are called to be living icons of God’s love in the world, Pope Francis said; and when they fight — and all couples do — they don’t have “to call the United Nations,” but find simple words and gestures to say they are sorry. “The plan that God has for marriage is really something stupendous,” he said. But prayer doesn’t mean there always will be peace and harmony, he said. The demands of work, finances and raising children can frustrate couples and lead to arguments. “There are always fights in a marriage, aren’t there?” he asked the crowd. “Sometimes plates fly. You’re laughing, but it’s the truth.